Griffin GM Radiator Griffin Aluminum Radiator For Classic GM Cars. This Griffin replacement radiator has a 22" core width and is 18 1/2" tall. It has two rows of 1 1/4" tubes. The top neck is 1 1/2" diameter and the lower is 1 3/4". It will cool up to 600 horsepower. Fits 67-69 Camaro and 64-65 Chevelle + others. This Griffin replacement radiator has a 21" core width & 26" overall. It is 15 1/2" tall. It has two rows of 1 1/4" tubes. Top neck is 1 1/2" diameter & lower is 1 3/4". Fits cars with top neck on driv side, bottom pass side.For manual transmission. Universal 100% American Made Griffin aluminum downflow radiator. Perfect for a street rod or other application. Core is 17" tall x 18.75" wide. Two rows of 1.25" tubes. Total height is 23". 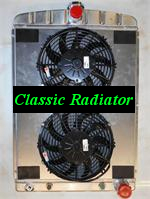 Includes a Spal fan, aluminum shroud, wiring kit & trans cooler. Universal fit 100% American Made Griffin aluminum downflow radiator. Perfect for a street rod or other application. Core is 17" tall x 18.75" wide. Two rows of 1.25" tubes. Total height including fill neck is 23". Includes a trans cooler. Universal fit 100% American Made Griffin aluminum downflow radiator. Perfect for street rod or other application. Core is 19" tall x 18.50" wide. 2 rows of 1.25" tubes. Total height including fill neck is 25". 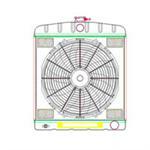 Has SPAL fan, wiring kit and aluminum shroud. Universal fit 100% American Made Griffin aluminum downflow radiator. Perfect for a street rod or other application. Core is 19" tall x 18.75" wide. Two rows of 1.25" tubes. Total height including fill neck is 25". Includes a trans cooler. 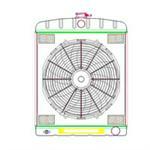 Universal Griffin aluminum downflow radiator. Perfect for street rod or other application. Core is 21" tall x 15.50" wide. 2 rows of 1.25" tubes. Total height including filler is 27". 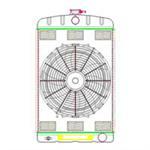 Has trans cooler, shroud and SPAL fan & wiring kit. Universal Griffin aluminum radiator. Perfect for street rod or other application. Core is 22.5" x 18" wide. Two rows of 1.25" tubes. Total height at filler neck is 28.5". 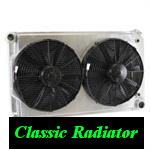 Includes aluminum shroud and dual SPAL fans & wiring kit.